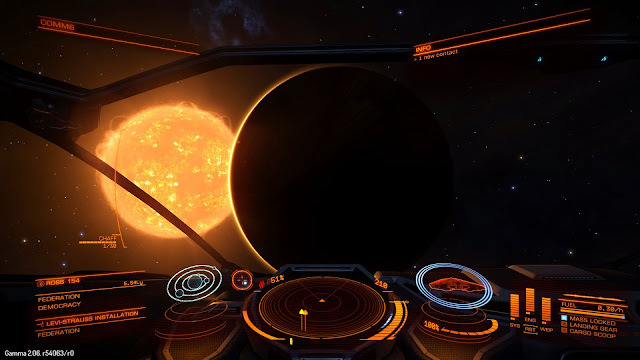 So Elite Dangerous has been finally released to the masses. We're no longer in alpha, beta or even gamma anymore, this is the real deal. Kickstarter Backers and Paid Beta Testers will probably notice that there aren't any release notes with this release and that the patch is extremely tiny, probably because version 1.00 is just Gamma 2.07 open to the masses. I guess the question everyone is asking though, is the game worth it? Did the rush to release before the end of this year compromise the quality of the game? Once I've played around a bit more with the actual release of the game, I'll get back to you with an answer to the first question. With respect to the second, personally I don't think so. The game's definitely got less features than originally promised such as the controversial move to remove offline-only play and the fact you can't play with your friends as one unit (you're currently able to check where they are in the galaxy though with a simple friends list feature but that's about it). Apparently the ability to form "alliances" which allows players to all jump in at the same time and engage in combat with each other in the same instance (without the need to fiddle around like you do at the moment) will be implemented next year, so while it's disappointing that features such as this one have been postponed it's still in the pipeline. Also it might end up being a wise move to hold back on implementing new features so close to release since that's a sure-fire way to make your game buggy - and thankfully I haven't really encountered many (noticeable) bugs while playing Elite Dangerous. In fact, I think the game is less buggier than Dragon Age Inquisition at least with respect to performance which is a real killer for me at the moment - so much so I played Elite Dangerous instead of Dragon Age Inquisition because at least the game worked on my PC. Steep learning curve (SLIGHTLY LESS): The revamped tutorials have helped this somewhat but there are still so many things in the game that I've only learned thanks to reading forum posts and asking questions of veteran players. Most of what I've learned about mining, setting up hardpoints, bounty hunting, accepting counter-offer missions and not overshooting space stations are all thanks to trial and error. In a game where you've only got one save game slot this could mean very costly mistakes. Mouse and keyboard at a disadvantage (USE JOYSTICK): Pretty sure this is still the case. Lucky I have a joystick then right? If you're planning to play this game, I'd almost say it's not worth playing unless you have a joystick. Lonely universe (DEPENDENT ON LOCATION): I'm now situated near the Solar System which I guess could be considered the Federation core worlds and there's definitely a lot more traffic now, NPC and Humans - so the galaxy doesn't feel so lonely any more. As I learned more about the game too I noticed that there's a chance for optional random encounters while in Super Cruise called "Unidentified Signal Sources" which you can investigate. Usually these are NPC populated instances but it at least gives the illusion that stuff is going on in the space around you. Laggy (STILL EXISTS): I'm not sure where the servers are located (most likely the UK) but this is probably always going to be an issue playing from Australia. While I still get the occasional lag spike while going through hyperspace, it doesn't matter too much during those sequences since it's basically a loading screen. When you're exiting hyperspace into a star or when you're trying to avoid interdiction from a pirate, that's when it becomes slightly annoying. Plot (WAIT AND SEE): The jury's still out on this one since apparently they weren't going to do anything major in terms of the actual plot/storyline until release - which is now! One good change they have implemented though is that each time you complete a mission it shows which factions you are receiving a reputation boost with (as opposed to before where you received no feedback whatsoever). So overall I think a lot of things have been fixed in the game and a lot of things make more sense to me now, so the game is not all that bad. I'm actually playing it like my own version of Euro Truck Simulator but in space and it seems to suit me just fine. Would I recommend people to get their hands on it just yet? As I mentioned earlier, I'll need more time to give a definitive answer (i.e. a review) but one thing's for sure: if you were a fan of Frontier: Elite II I think you'll like this game since it definitely feels more like an Elite game than your run-of-the-mill space sim.